Ticks are related to spiders, mites and scorpions. There are many different species of tick living in Britain, each preferring to feed on the blood of different animal hosts. 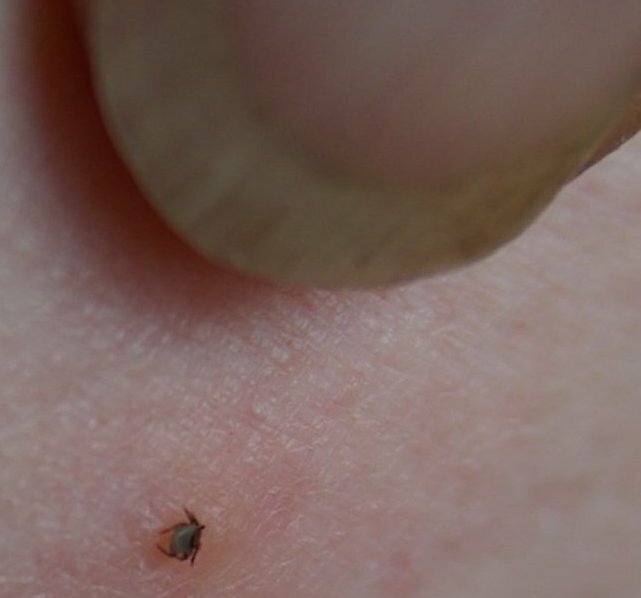 The one most likely to bite humans in Britain is the Sheep tick, or Castor Bean tick, Ixodes ricinus. Despite its name, the sheep tick will feed from a wide variety of mammals and birds. 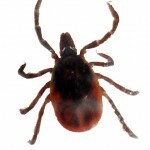 Bites from other ticks are possible, including from the Hedgehog tick, Ixodes hexagonus, and the Fox or Badger tick, Ixodes canisuga. The Ornate Cow Tick Dermacentor reticulatus can bite humans, but records are rare. This tick is currently only recorded in W Wales, N&S Devon and Essex – mainly in coastal sand dunes and marsh, but recently in Essex grassland (5). It carries canine babesiosis and is a risk to dogs, and it is implicated in transmission of Tick-borne Encephalitis (TBE) which is not yet present in the UK. This tick has ornate markings on its back and is often pictured in UK newspapers, despite its rarity in the UK! There are different ticks in other parts of the world and they carry different diseases. If you take your dog abroad, be aware of this and take suitable precautions. The Brown Dog Tick Rhipicephalus sanguineus has been brought into the UK from Europe on dogs and can survive and reproduce inside a home, unlike the native UK ticks. In the USA the highest risk comes from the Deer tick, Ixodes scapularis, but this is not known in Europe. There are four stages to a tick’s life-cycle: egg, larva, nymph, and adult. Larvae, nymphs and adults spend most of the time on the ground protected by leaf litter, leaving this protection to find a meal. They feed only once in each stage, staying attached for a few days, then dropping to the ground to moult into the next stage or overwinter. The whole life cycle from egg to adult lasts around 2 years. To the naked eye the larvae look like minute pale spiders, not much bigger than a full stop. Nymphs are slightly larger and darker, pinhead or poppy seed size. Larvae have six legs and nymphs and adults eight. It is the nymph which is most likely to bite you. To see what an adult tick looks like in motion, watch this brief video. Public Health England have produced a longer 3 minute video with some very good images of ticks. Ticks can also sometimes be found in private gardens, especially those with shady shrubberies or deep vegetation and a strong local wildlife population. Numbers vary from place to place and from year to year, but ticks can be found across the UK . 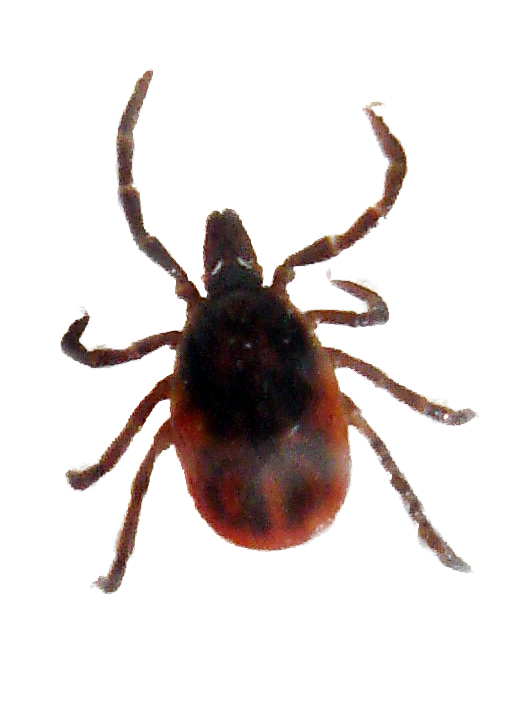 Not all ticks carry disease, and infection rates in any one place may fluctuate from year to year. See Dr Sarah Randolph’s presentation at our 2008 conference: How does tick ecology determine risk? How do they pass on disease? Ticks feed on the blood of other animals. If a larval tick picks up an infection from a small animal such as a mice, when it next feeds as a nymph it can pass the infection to the next animal or human it bites. They cannot jump or fly, but when ready for a meal will climb a nearby piece of vegetation and wait for a passing animal or human to catch their hooked front legs. This behaviour is known as questing. The tick will not necessarily bite immediately, but will often spend some time finding a suitable site on the skin, so it is important to brush off pets and clothing before going inside. The Public Health England website has some useful pages on ticks including a video and details of their tick recording scheme. See our leaflet on these diseases, “Tick-borne Diseases in Britain” (PDF 255KB) Globally, the list of diseases carried by ticks is much longer. Some ticks carry more than one disease at the same time and could transfer them to you in a single bite. The resulting symptoms can be confusing and liable to misdiagnosis. Treatment in such cases may be difficult. It is not known how often this happens in the UK. The tick that generally bites humans (the nymph stage) can be as small as a poppy seed as seen here beside the fingernail. 4. Robertson JN, Gray J, Stewart P. “Tick bite and Lyme borreliosis risk at a recreational site in England.” Eur J Epidemiol. 2000;16(7):647–52. 5. Medlock JM, et al. Distribution of the tick Dermacentor reticulatus in the United Kingdom. Med Vet Entomol. 2017;(April).